Sin-tax: Not that we're ones to talk—college is an interesting time in the career of everyone's prose—but how it was said makes this basketball blurb from the 1999 Glom almost as amusing as what was said. Auburn’s men’s basketball team played its final regular season game Saturday to cap off a year that will see them finish right about where the media expected them to finish in their preseason rankings—near the bottom of the SEC. While expectations were low coming into Coach Tony Barbee’s second season, they were nowhere near as low (we’re talking subterranean) as those heading into the 1998-99 season. Apparently those Tigers were supposed to be so bad that they were expected to lose before they even played a game. At least if the 1999 Glom is to be believed. That’s pretty bad. Even for Auburn. While most Tiger fans will remember that team as one of the best in school history, finishing the regular season 29-4 and earning a No. 1 seed in the NCAA tournament before eventually losing in the Sweet Sixteen to Ohio State, they did enter the season unranked in the AP poll. Still, it’s hard to imagine any credible media predicting they would lose before they even took the court. 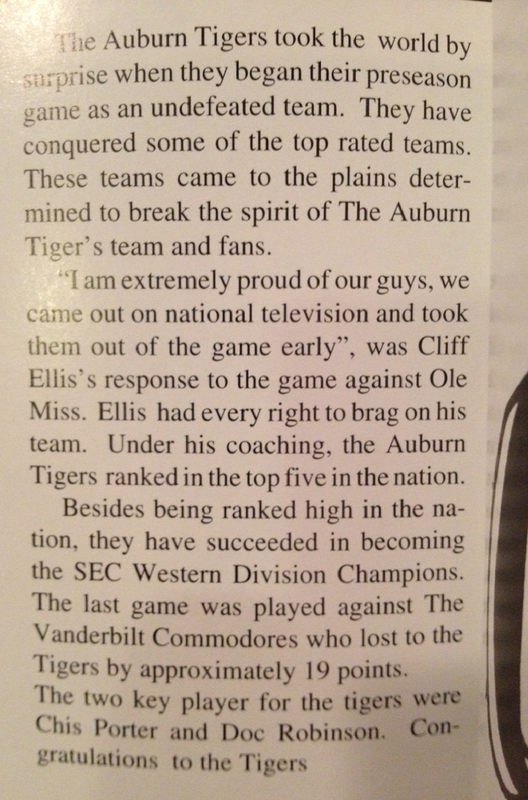 Fortunately, Cliff Ellis’ team far exceeded all expectations and “conquered some of the top rated teams” that “came to the plains determined to break the spirit of The Auburn Tigers team and fan.” Chris Porter and company instead continuously showed that a spirit that is not afraid cannot be broken. The enormously underestimated Tigers even managed to beat Vanderbilt “by approximately 19 points.” Winning by approximate scores is no easy feat and clearly exhibits the new level of respect the team earned over the course of the season. Despite the struggles of the Lebo era and the early hurdles Barbee’s young squads have faced, no Auburn team during that time has been picked to start a season in the red. Sadly, no team during that span has exceeded expectations quite like that ’98-99 team did either. Maybe next year. That’s fantastic! Who was the editor? “Approximately”, really? They must have won by 18.75. Ha. I was sports editor for that year. Don’t remember writing that, but should have at least re-worded it. Definitely sarcarsm there – we (the sports staff) were huge basketball fans that year. jdinmacon – It was a minor blip in an otherwise splendidly edited volume. I don’t think I’ve ever edited anything that didn’t have at least one crushing error somehow slip through. I hope this didn’t come off as too mean spirited, as I just wanted to share something that gave me a good laugh as I thumbed through my old yearbooks. There’s plenty in those old gloms that still give me a good laugh – trust me! I’ll gladly enjoy the notoriety of having written (maybe) the “best or worst thing about Auburn Basketball” ever. After a little digging….I noticed this blurb was located in the “Retrospect” section of the book, page 492 to be exact, and nowhere to be found in the Sports section, where the writing is, thankfully, somewhat better. Alas, the author is not listed, and I’m pretty sure it wasn’t me or anyone on my staff at the time. The Retrospect section was pretty much cobbled together at the last minute (as is much of the back of the book after the “People/Greek” pages, so it’s no surprise the writing was, um, less than up to standard. – J.D. by the way – that is THE sickest dunk of all time by an Auburn player. I was there and literally lost my mind.